We had a great time at the Royal Oak Elks Lodge in Royal Oak, Kitty does a great job over there. It was very simple to coordinate with their staff. Everything just fit together perfectly. By the time we finished our sound checks the guests started arriving. For the first hour of the reception there was a cocktail hour while the bridal party took photos at a secondary site. In addition to the DJ entertainment Encore also provided uplighting to accent behind the head table. It gave a nice warm glow to room as it matched with their wedding colors. The client really loved how the lighting looked once it got dark outside. All it took was about a dozen fixtures in the room to give it that WOW factor. Some fun things that happened through the evening included a high energy line dance, shout, and Jesse got silly stringed after the garter removal (we had nothing to do with that btw). We also provided lighting design for the walls that was used behind the head table for one awesome backdrop. I wanted to thank Gerald Donnelly of OnSite Photography for some courtesy shots. One of the best part of the night was the cake the client had made. It was seriously one of the best cakes I have ever had in over 1,000 weddings. There was even rose petals decorated all over it. The client told me they made their cake with something called chocolate ganache. The guests add a lot of cake, but there was still a lot left after the wedding reception. The client was so happy at the end of the night. We took a photo with the client and they gave us cake. When I say that they gave us cake, I mean that they gave us a lot of cake. We probably got 3 boxes worth before we left. The client was just begging for us to have take it since there was so much left. You can see their satisfaction survey at the link. And once again congratulations to the both of you. Are you looking for wedding DJs in Royal Oak, then check our availability on the right! We have the tools and options available to make your party a huge success. 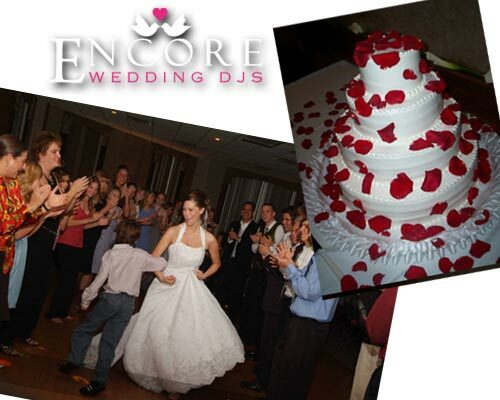 So contact us if you want to hire the right entertainment company in Michigan for your one wedding reception.